Health and Social Care Secretary Jeremy Hunt has announced a £215 million package of funding for research that could transform the lives of millions of people who are living with a range of conditions, including life-long illnesses, mental health issues and obesity. Leading academics and technology experts will be able to apply for research funding to develop health solutions for the future that give patients greater independence and choice about how they manage their healthcare. 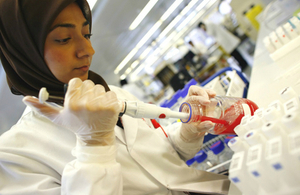 An investment of £150 million will fund research over the next 5 years to tackle important emerging issues, including the pressures of an ageing population and the increasing demands on the NHS. The remaining £65 million will go towards 13 National Institute for Health Research policy research units that will play a vital role in making sure the government and arm’s length bodies have the best possible information and evidence available when making policy decisions about health and social care. Each university-based unit will host a multidisciplinary team of researchers from collaborating institutions to create a critical mass of experts for research in priority areas for health and social care policy. An extra £3 million will also be invested in the creation of a new research leader programme for nurses and midwives. Their role will help to influence new approaches to health and care and improve patient experience. "As the NHS celebrates its 70th birthday, more people than ever before are living longer lives thanks to the dedication of hardworking staff. It is therefore vital we harness technology to develop the next generation of innovative treatments as part of the government’s long-term plan for the NHS. "That’s why I want our world-leading academics, researchers and technology experts to work with frontline staff to develop the innovations which not only allow people to live longer, but also to lead healthier lives, so the NHS can continue to provide world-class care to all." "With a growing and ageing population, maintaining a world-class NHS depends on harnessing the discoveries of cutting-edge research and rapidly bringing them into everyday healthcare. "The UK has a proud tradition of ground-breaking medical R&D and this funding means our country can continue to lead the world."